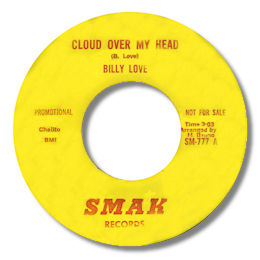 I'm afraid that Billy Love is so obscure that I can't be certain that he didn't have any records apart from this fine effort on LA's Smogville. Cloud Over My Head is a deep soul track to look out for. I like the "chopped" rhythm guitar and the well arranged horn charts but most of all I like Billy's wholehearted vocal especially as the song progresses when he gets more and more impassioned, finally screaming his way towards the run out groove. Excellent. 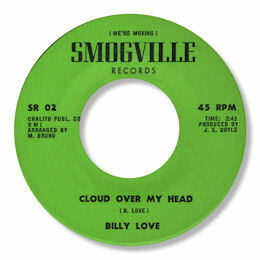 UPDATE ~ Will Porter kindly writes to say that Smogville was an Oakland, CA label not one from LA. He also advises that the date of the recording was 1968. I'm grateful to Will for putting me straight. FURTHER UPDATE ~ Thanks to Naoya Yamauchi I now have a copy of the Smak release. As he says it is the same recording but about 125 seconds longer than the Smogville. I am sure he is right to say that the Smak issue was most likely the first one. I'm very grateful to Naoya for this.